So far, governments have opted to deal with the problem of space junk by implementing policies to reduce the creation of more debris. But that alone won't cut it — we also need to be removing stuff from orbit. One way to cover the high costs of space junk disposal would be a $1 tax on every GPS chip in a smartphone. 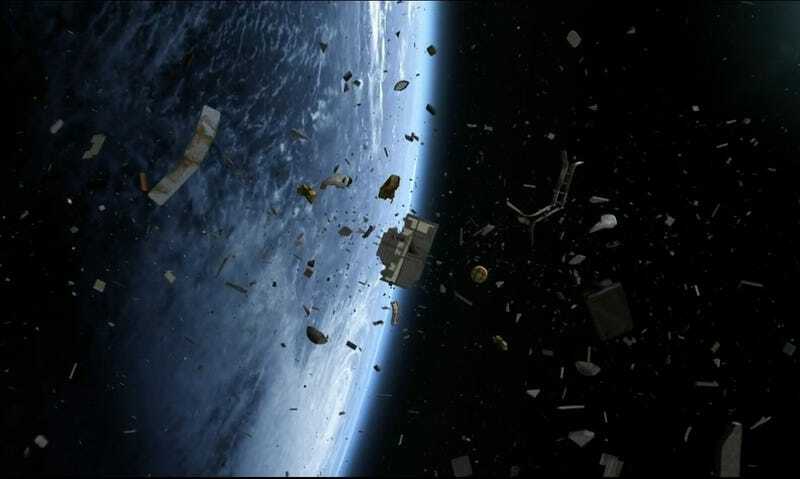 "Everybody who's looked at the problem comes to the same conclusion: if we don't start removing five to ten objects per year for the next 100 years, we'll have an unstable environment," said retired NASA scientist Donald Kessler at a recent conference on orbital debris. [James] Armor, now the vice president of ATK Spacecraft Systems and Services, said his company had looked at debris removal as a potential application for its ViviSat satellite servicing venture. The results were not encouraging. "Right now, there is no business case for debris mitigation. You cannot rely strictly on commercial market forces to mitigate this," he said. Armor and others suggested ways to help improve the case for active debris removal. That includes direct funding of debris removal efforts, either through government contracts or through a "bounty" system where the government offers to pay a set amount to remove a specific object. [James Dunstan, founder of Mobius Legal Group], suggested a bounty system could be funded by placing a $1 tax on every GPS chip in a smartphone. "Sooner or later it adds up to enough money that people would actually go after some of this stuff," he said. Dunstan also recommended that the government fund development of debris removal technologies, then transfer them to the private sector. He also recommended an indemnification regime for debris removal companies that would be similar to what exists today for commercial launches, where the government commits to pay for any damage above a certain amount that the company must insure against. But, before any of that can happen, Dunstan and others agree that there needs to be a single government agency responsible for overseeing debris mitigation and cleanup. "Who the heck is going to regulate it?" Dunstan said. "We need to determine [that]."